Beginning 15 February 2011, a series of protests and confrontations took place in the North African state of Libya against Muammar Gaddafi's 42-year rule with protesters calling for his ousting and for immediate democratic elections. By the end of February, it had escalated into an armed conflict with rebels controlling Benghazi and other cities in much of the eastern part of the country, with Gaddafi controlling Tripoli in the west and with fighting and casualties fast-approaching the scale of a civil war. In early March, Gaddafi's forces, greatly outnumbering and out-powering the rebel ranks, rallied and were victorious at several coastal cities. On 17 March 2011, the Security Council voted by ten votes to none to approve a no-fly zone through Resolution 1973. There were five abstentions: Brazil, Russia, India, China and Germany. Coerced by international pressure, Gaddafi declared a cease-fire on March 18, though they continued to bomb and shell the rebels and on March 19 began an attack on Benghazi. Hours after Gaddafi's unilateral cease-fire declaration, the United Nations endorsed multinational military intervention against Gaddafi and launched a series of raids on regime military targets. 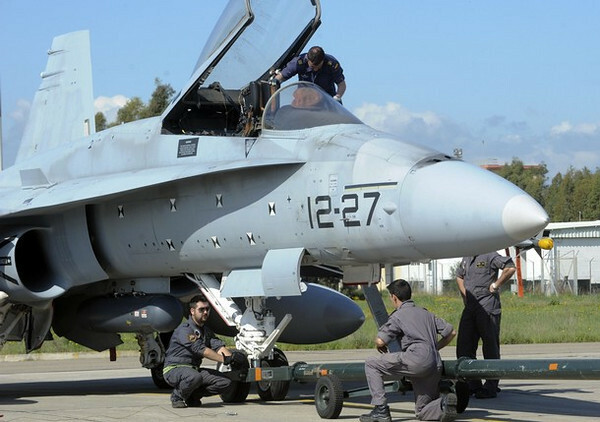 Spanish ground crew work on an F-18 jet fighter plane at the NATO airbase of Decimomannu, in the southern Italian island of Sardinia, March 20, 2011. NATO ambassadors approved an operations plan for the alliance to help enforce a U.N. arms embargo on Libya on Sunday, a NATO statement said. Picture taken on March 20, 2011.